A New Look for Marai Perhaps? Almost every fridge in Saudi Arabia will most probably be filled with Al Marai Dairy products. 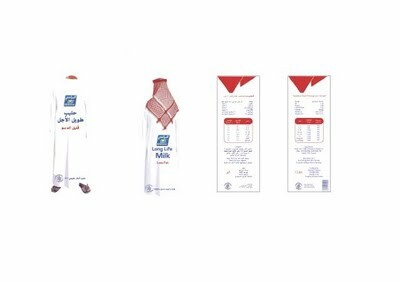 As long as I can remember Al Marai Milk was the population’s favorite milk, but not anymore; Marai Shocked the Saudi market by increasing the price of their milk by 1 SR. While this might seem reasonable to the company and other entities due to inflation and other economical reasons, this has created an outrage in the Saudi community. Campaigns have started all over the country through text messages, Facebook groups and twitter. Competitors have taken advantage of this and made announcements that they will not be raising their prices, Smart advertising Huh?! By making this announcement not only they have assured their customers, but got their message across to Al Marai customers, and by that they have made their brand an alternative in an “Indirect “way. Now weather this decision is justifiable or not, I don’t know. Of course I’m against companies raising their prices, because it’s not fair on us “the consumers”; but some saw that the boycott was taken to the extreme and was harsh. Almost all brands in a variety of divisions raised their prices in the past few years, vegetables, dairy, rice, meat…Everything became more expensive. Think how much grocery were you able to buy with 300 SR and what 300 SR buys you these days! Let’s face it, there is a difference!! I believe that the boycott shouldn’t be towards one certain brand, it should be an organized campaign against an act “of raising prices”. A Boycotter said: this will teach other brands not to do the same thing! Now this threat might work for some time, but it won’t be effective on the long run. I think some sort of public committee should be formed; monitoring the prices of products in the market while keeping in mind changes in economical factors. On a quarterly basis reports can be made, and companies who raise their prices can be contacted by the committee. If there was no sufficient response or collaboration from the company’s side then a boycott can be arranged. If you were a loyal customer and this has really upset you, then Al Marai should be proud because voicing your opinion means You Care. If you are a customer who is boycotting because you are afraid that other brands will follow, we all had enough with expenses breaking our backs, but there are always alternatives. If you are just following a trend, or boycotting just because everyone is doing it, and you would like to contribute somehow to the community; I say your intentions may be good, but think again about your motive and act accordingly. A Message to Marai: Your customers, your people, the generation which has been raised on your products are mad at you. This reaction shows that you have so many lovers and even more haters. If you are not planning in going back with your decision, then you should be thinking of ways to make it up to your customers “of course only if you still care”. Maybe a press conference, a message on your website, maybe even an Apology. Many might not accept this apology because raising your prices meant that you have betrayed them and put the relationship on the line. All these years, they have stood by you, loyalty was their trade even with the emerging influx of competing brands. Now they might switch or already have switched from Marai, but you owe it to your customer or X Customers. Explain why you did this, be honest & let the people make their own decision. Repay Loyalty with Loyalty or maybe you should consider a “New Look”. Updates After the Boycott: Within few days of the Boycott the company suffered huge losses, the Ministry of Commerce banned the raising of milk & dairy products, and Al Marai was forced to bring their prices back again. This entry was posted in General, Saudi by sousalz. Bookmark the permalink.